​through heart-opening programs and soul-nourishing retreats. All retreats are contemplative, inter-religious/interspiritual, and sourced in spiritual direction principles and good practices. 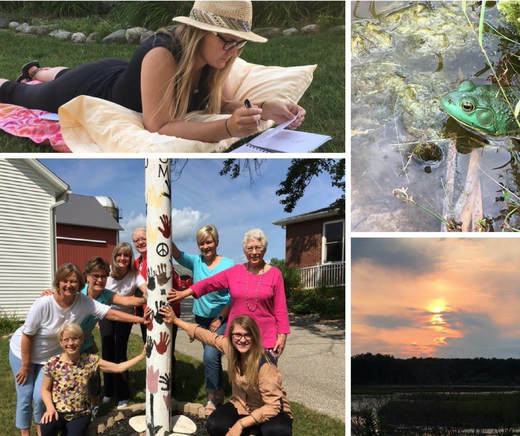 Retreats with Jan are a one-of-a-kind offering. Each is an intimate retreat with personal attention and is designed to accommodate only 7-12 people. ​Format: Interactive but contemplative group sessions. Reflection, guided meditations, loving-kindness practice, breath & body awareness, journaling, sacred time in nature. Outdoor labyrinth walk. Silence, solitude and support in a compassionate community. Inter-spiritual in focus. Plenty of private time is built into the weekend for you to rest & rejuvenate yourself. Jan and the Inn's caring staff are here to help you do "the kindest things" for yourself all weekend long. These retreats are popular and fill early. ​A $50 non-refundable deposit is required to hold your space. To reserve your space, contact me here. A retreat at The Inn at the Rustic Gate is a nourishing, one-of-a-kind, "5 Star" experience. Innkeepers Marcia and Pat offer extraordinary hospitality in this fully restored turn-of-the-century, 7,500 sq. ft. farmhouse in the heart of Michigan. Situated on 150 acres of woodlands, wetlands, rolling meadows, and a private pond, it is a true sanctuary for the body & soul. Commune with abundant wildlife. Stroll or hike to your heart's content. Sit on the porch and listen to the birds. Walk the outdoor labyrinth. Cross-country ski or snowshoe in the winter months. Guest rooms are beautifully appointed with comfort and rest in mind. Each has a private bath. Use the library with hundreds of books and audio programs on spirituality & psychology. Enjoy the loft meditation room, outdoor yoga space, and more. You will dine on gourmet, organic food, consciously and lovingly prepared by Chef Sharon. All dietary needs can be accommodated. Closest airport for air travel to Big Rapids is Grand Rapids, MI. ​"The weekend was fantastic--exactly what I needed. Time for fellowship, thinking, examining beliefs, personal growth, and time for good food and rest and retreat--it really was the perfect balance as a platform for me to offer myself self-compassion and work through some issues in my life and my beliefs about myself." ​"Beautiful, thought provoking. The setting of the Inn was perfect for this retreat, lovely venue, and the energy was lovingly charged with nothing but caring and kindness. Thank you for your calm, compassionate presence and helping me feel loved as I am, right here, right now." "I left feeling refreshed, inspired, confident ...."